Brian Draxl has been the head pro for NCTC since 1995. He played for the University of Toledo on a tennis scholarship. He was ranked #1 in Ontario for the over 35, over 40 and over 45 division; and was the over 45 National Singles champion in 2011. 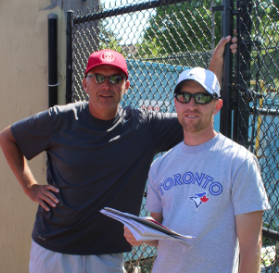 He is certified by the Ontario Tennis Association and Tennis Professionals Association. Brian has been primarily responsible for the success of the club, particularly the juniors, over the past 25 years. During that time, we have seen our juniors do increasingly well in all facets of competitive play, from ICTA teams (both junior and adult), OTA tournaments, and university tennis, both US scholarships and Canadian university tennis. Brian continues to put forth great effort and dedication into grooming players of all ages that want to improve their tennis skills. We are extremely grateful to have him at our club. Our Club Pro, Shane Hickson, has been a part of NCTC since 1994. He has been coaching for 19 years and our club manager for 13 years. He was formerly ranked #1 in OTA's Men's "A" division, and won back to back men's "A" provincial championships. Shane has been a key contributor in helping Brian with our successful Junior development program. Shane can help you improve your strokes and offer tips on strategies for your single’s or double’s matches. He is fantastic with teaching kids by making it fun and engaging. Shane continues to be a huge asset to our club. Adult & Junior lessons are available at the beginner, intermediate and advanced levels. All group lessons are 1 hour sessions for 8 weeks and start the week of May 5th. The second set of 8 week lessons will begin July 14th. Days and times of lessons are available at registration on a ﬁrst come, ﬁrst serve basis. You must register in person, March 28th from 9:30 to 12:30 p.m. for lessons. This event will take place at the Newmarket Youth Centre and sk8park at 56 Charles Street in Newmarket. On that day, you will be able to discuss which House League program or club lessons you would like to enroll in.